While international media attention focuses on events in Goma, the political and military landscape of the eastern Congo is changing as Kabila’s hold crumbles in North Kivu. 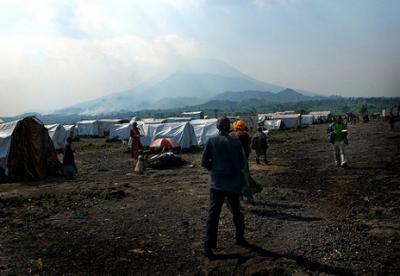 A camp for internally displaced refugees in North Kivu. Photograph by Aubrey Graham/IRIN. It started with text messages and phone calls, numbers blocked, followed by visits at night: “we are numerous and of various ethnicities” they said before issuing their threats. Some of the messages appeared to be invitations: “join us or face us” or “do not think you are stronger than fire” while others were unmistakeable signposts to a bad end for those who spoke out against war in the Eastern Congo. After the threats came disappearances and abductions, too easily dismissed as ‘banditry’ and barely mentioned except in whispers for fear of being next. There was no doubt that insecurity was increasing but for those who know the lie of the land, the abductions indicated that a pattern was forming that included human rights defenders, civil society, local chiefs or anyone who challenged the M23 insurgency. People were confused; M23 was no longer a story rumbling at a distance from the borderlands of the region known as the Grand Nord, which stretches down from the Rwenzori Mountains, past Lake Albert and across the Virunga national park. While the international media focused on Goma, they ignored the quiet but steadily developing parallel situation in the Grand North. One inhabitant told Think Africa Press, “There are two fronts to this war and only one is being reported”. They are not easily frightened around Butembo, Beni and Lubero. The history of wars, militias and violent reprisals has reached everyone’s door, marked everyone’s path, coloured memories with sombre hues and never really left. During the war, the Catholic Bishop of Butembo, in association with local Nande businessmen and politicians, forged strategic alliances with gunmen that enabled a University to flourish, transnational trade links to bring luxury goods, built an elegant Town Hall, paved roads to some parts, providing an appearance of order. For their clients the gunmen guarded the petrol stations, kept the towns calm and enabled business to continue unhindered – for a price. Above all, they allowed the borders to function as a black market free-trade zone in a region that has always been vital for Central Africa as a transit point to the coasts. Congo’s neighbours Uganda and Rwanda have a long history of cross border meddling. Like psychotic twins suckled in the same political nursery, they unite, fight, collude and compete. After the DRC’s then President Laurent Kabila turned on the Rwandan forces that helped topple Mobutu and installed him as president, Rwanda formed the RCD – Rassemblement congolais pour la democratie – in the Kivus and the war multiplied into a deadly conflict that involved 8 countries. During the Congo wars the Beni and Lubero territories came to be dominated by the RCD-KML a breakaway from the original RCD forces. RCD-KML was backed by factions from Uganda and headed by Antipas Mbusa Nyamwasi who controlled territory all the way to Kisangani, 400 kilometres west of Butembo. The RCD which then became the RCD-G(oma), was the proxy of Rwanda and became the parent of the CNDP which in turn has birthed M23. Nyamwisi maintained his fiefdom into the post-war transition period by playing off a complex and volatile mix of local Mai Mai, Rwenzori fighters, and Nande traders. Ever the opportunist, he shifted his allegiances to Kinshasa and became a minister in Joseph Kabila’s government before running against Kabila in the 2011 elections. Voting in the Kivus is never a simple matter. The political classes are so often tainted by association with militias and self-interest that marking a ballot can be a Hobson’s choice. “The election motivates many people and many armed groups to go back to using guns as a way to try and gain power… many ex-combatants are going back to the bush now. Violence is what they know” a community worker explained. In the Grand Nord a local politician’s popularity can often be directly linked to the deals that come from border control, cheap petrol and other imported goods via Uganda is a winner. The electorate, disappointed in the way the presidential elections were compromised, watched silently as militia-backed political factions made preparations to control the outcomes of the next round. So when a growing insurgency further south seemed to threaten, they did what Congolese do best, they organised and protested. RELATED POST: DRC: Who are the Raïa Mutomboki? Blowing vuvuzelas they took to the streets every day at 12 o’clock, wrote press releases ignored by the international media, reported what they saw with their own eyes. As darkness fell they formed neighbourhood patrols and the same whistles and vuvuzelas used in the daylight, became warning claxons to scare away the gunmen that broke into houses to kill or abduct. These cries for assistance in the night were supposed to alert the local military except in too many cases the soldiers ignored them, turning their heads until someone else in authority further away would finally show up. The fears grew, names were muttered, protests were dampened, some who had spoken out the loudest fled. All through the summer, as diplomats passed time debating ‘solutions’, the military build-ups continued. Weapons, soldiers and equipment slid across the Ugandan border, often at Kasindi which was controlled by Mbusa Nyamwisi’s brother until the Kabila government removed him. Alliances were cemented in Rwenzori and further north in Ituri an attempt to integrate troops of Cobra Mata into the national army saw 1000 of them disappear off the official head-count. Aid projects in Ituri ground to a halt as militia activity increased and the FRPI attacked civilians along the shores of Lake Albert. Alongside this, a defecting Congolese army (FARDC) officer, Major Hilaire Paluku Kombi, retrieved weapons stored at Nyamwisi’s house and joined his forces with those of another militia leader, Jacques Tahanga Nyoro. Nyoro, an FARDC deserter, was formerly a member of the APC, an armed wing of the RCD-KMLA. This alliance was facilitated by Mbusa Nyamwisi, a UN report charges, who wanted Nyoro as a spokesman. Too weak to control territory on their own, and with Nyamwisi making the introductions, they had already allied themselves to M23. Congolese organisations observed that some of these previously impoverished militias were now awash with money. Civil society activists denounced the recruitment of youths in Rwenzori, South Lubero and in the suburbs of Beni but no-one listened. Butembo has already fallen quietly under the military control of Mai Mai PARECO ‘General’ Kakulu Sikuli Vasaka Lafontaine, a Nande whose forces were also integrated into the national army alongside the CDNP. The UN Group of Experts report notes frequent communication between former RCD politician Xavier Chiribanya Chirimwami and FARDC deserter Colonel Albert Kahasha of the ‘Union des patriots congolais pour la paix’ (UPCP) in Southern Lubero. According to the report both Kahasha and Lafontaine assisted FARDC deserters to join up with M23 in Rutshuru. While the international media focus on erroneous March 2009 agreements, fighting and humanitarian catastrophe further south, another war is being fought in silence alongside. This is the quiet but steady penetration of localities away from frontlines, by those committed to the overthrow of Kabila and the control of territory that lies around the borders with Uganda and Rwanda. All along Lake Albert’s shores and in villages from South Kivu to Ituri this invisible destabilisation and alliance-forming has continued unabated, creating localised networks of terror. After Goma’s fall on November 20, students across the DRC reacted angrily against those they held responsible. In Beni and Butembo, students attacked the troops from the UN peace-keeping force (MONUSCO) and burning the office of North Kivu governor Julien Paluku. Paluku was once a leader in Nyamwasi’s RCD-KML but broke the relation to join with Kabila during the elections. Enmired in a massive corruption scandal and having been outspoken about the politics of the region, Paluku, despite returning to Goma, seems to be persona non grata in the Grand North and cannot return. RELATED POST: Sexual Violence in the DRC: What Good is the Dodd-Frank Act? As the insurgent landscape shifted in and around Goma and the city fell into M23 hands, Tahanga Nyoro announced on local radio in Beni that he wanted to take the town: “as no-one is in control.” While currently Beni is very quiet, the few soldiers remaining in the town are all former CNDP officers and their guards. On the streets the people huddle in small groups quietly sharing their fears. The citizens of Beni, while unsure of the details, have sensed that control of their town is already a done-deal. In the spring the Congolese army were causing chaos for civilians as they hunted down the ADF-NALU militia, Mai Mai PARECO and the FDLR, but now with troubles further south, the army has all but disappeared. The soldiers were all troops ‘integrated’ into the national army from the CNDP. To counter their threat, Joseph Kabila ordered one Lingala-speaking and therefore supposedly loyal battalion into the area. They are the only remaining battalion, some 40km from Beni camped in a village groupment that is now so afraid of an attack by insurgents against FARDC the residents near the camp leave their homes to sleep in the forest at night. As President Museveni convened meetings of the International Conference of the Great Lakes Region and hosted M23 representatives in luxury houses, his brother General Salim Saleh, previously cited for corruption in Uganda and for his participation in an elite ‘trans-border shadow network’ that plundered natural resources during the Congo war, was attempting to heal a rift between Mbusa Nyamwasi and Kakolele Bwambale. Kakolele, another ghost from the CNDP past, had been jailed in Uganda in 2006 after Mbusa Nyamwasi accused him of assisting in the infiltration of Rwandan troops into Beni. The re-emergence of these ghosts of past wars hints at what is to yet to come. Whether marked by a colonial pen or the administration of a chief, border zones are sites of exchange, and attempts at subversion. In 1997, academic Mahmood Mamdani identified two tendencies in the Kivu conflicts: militarism and the tendency for all organised politics to take the form of armed politics. These ‘opportunistic lines’ now run all the levels from the price of soap in Beni market to the oil and gas contracts along the Albertine Graben and the Congolese borders with Uganda and Rwanda. The shape-shifting M23 insurgency represents a collision of these militarised interests and chaotically links them together through localised land and identity politics, various diasporas across the world, all the way to states that merge national interests with a corrupt form of military entrepreneurialism. The tentacle-like appropriation by factions within neighbouring states of the land alongside the borders through the chaos of militia groups and civilian terror risks further deterioration if and when some of these alliances collapse. Museveni was trounced in local elections in Ugandan provinces along the border and Kagame holds together an increasingly delicate balance of internal interests. The fall of Kabila’s government risks being the domino that triggers the border zone cascade.